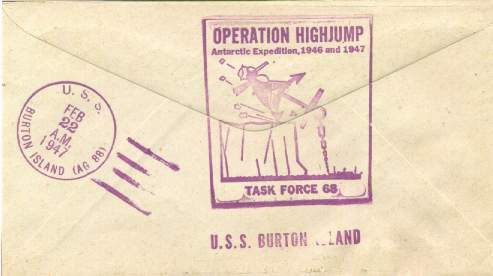 I have seen many, many examples of Operation Highjump covers, and several from the USS Burton Island, AG-88. This one from my collection however, is one of the more elusive varieties; attributed to W.G. "Bones" Crosby, the landmark naval cover cachet maker. They are truly among the classics in any naval or polar cover collection. The hallmark of Crosby covers are the miniature photograph of the vessel that is glued on to the cover. The covers featured thermographed or raised cachets, which means that the covers were first inked with a design and then a powder was sprinkled over the inked area. The envelope was then "baked" for a short time, which caused the plastic like powder to create a raised design on the envelope, creating a truly splendid effect. This cover has that raised surface effect, and it is probably one of the last covers Crosby had made up for servicing on any vessel--Crosby reportedly died before this cover came back to him. His wife carried on the business for a short time. This cover, which has the TF-68 cachet and straight line markings on the back side, only rarely shows up in auctions. A major difference with this one is that it is on the "revalued" to 5 cents air mail postal stationary and that makes it much more interesting, I think. I also like the nice magenta color of the cachets and postmarks. The USS Burton Island (AG-88) was launched 30 April 1946 by Western Pipe and Steel Co., San Pedro, Calif., and commissioned 28 December 1946, Commander G. Ketchum in command. 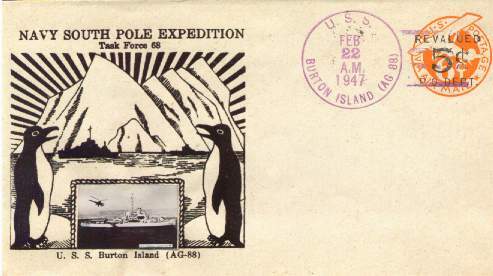 After receiving supplies Burton Island departed San Diego 17 January 1947 and steamed to the Ross Sea, Antarctica, where she arrived 8 February for rendezvous with units of Task Force 68 on the First (1947) Antarctic Development Project. She made her way through the ice packs to the Bay of Whales and unloaded supplies and received passengers for the return voyage. She arrived at San Pedro 31 March 1947 after steaming via Port Chalmers and Wellington, New Zealand; and Pago Pago, Samoa. After undergoing a yard overhaul she picked up supplies at San Francisco and Seattle and departed 25 July for the 1947 Point Barrow Expedition. At Point Barrow, Alaska, Burton Island's helicopters participated in ice reconnaissance and surveys. She returned to San Diego 24 August. Burton Island underwent overhaul and repairs at San Pedro and then joined the Second (1947) Antarctic Development Project. She arrived 1 January 1948 at Shackleton Ice Shelf and conducted hydrographic and geological surveys, ice reconnaissance, and demolition experiments in the area. She returned to San Pedro 31 March and underwent ice damage repairs at Long Beach. Between April 1948 and December 1956 Burton Island participated in 19 different type cruises in Arctic and Alaskan waters. Each time she returned to the west coast she received overhaul or repairs at either Long Beach, Mare Island, or Bremerton Naval Shipyards, then resumed her duties on the expeditions. Duties performed included: supply activities; helicopter reconnaissance of ice floes and packs; ice surveys and photographs, oceanographic hydrographic, geological, coast and geodetic, and hydrophone surveys; electronic interference surveys; underwater demolition team explosions in ice packs; and Arctic convoy exercises. Expeditions in which Burton Island took part were Point Barrow Re-Supply Expeditions (1948-51), MICOWEX-50 A; Beaufort Sea Oceanographic Expeditions; Bering Sea Explorations; MSTS Project 572; and several expeditions into the Bering and Beaufort Seas as far north as the Arctic Circle and the Canadian Northwest Territories near the Mackenzie River. During March 1949 while undergoing repairs at Long beach, Burton Island was designated AGB-1. The Pine Island was an aircraft carrier assigned to Operation Highjump. 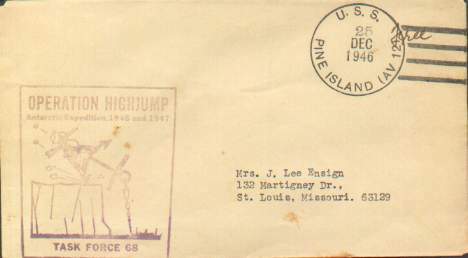 This is a good date for the Pine Island, as far as postmarks go. It was upon this day, Christmas Day 1946, that the very first helicopter was flown in the Antarctic by Lt. Commander Walter M. Sessums, a member of VX-3. [The Second Byrd Antarctic Expedition from 1933 to 1935 flew a Kellett autogyro. Even though an autogyro has rotating overhead airfoils (blades), and they somewhat resemble a helicopter, it did not technically qualify as a helicopter.] His passenger that day, whom was also aboard the Pine Island for Christmas, was Captain George F. Dufek (who later became a Rear Admiral and was Commander of Operation Deep Freeze I-IV). This particular cover appears to me to perhaps be non-philatelic in origin. It is a cheap Woolworth-type envelope, as opposed to being of rag content as many collectors would have sent, and of course, the free "franking" would make one think someone on board took advantage of the ability to send home a free letter. That free franking ability remained in place for some period after World War II, and this would have been mailed only about a year after the end of WWII. The placement of the cachet is rather careless--applied almost off the envelope, implying that philatelic treatment was not really given, as perhaps they knew it was just crew mail, given the free franking. Perhaps they had a cachet near the mailing area and sailors sending home their mail could adorn their letter with the cachet and were applying it themselves? That's my theory, anyway... you don't see many "free" covers from Operation Highjump-either that, or I have missed 'em! Comments welcome.